When 12-year-old Angus Wolfe discovers a cache of documents near the site of an old swing bridge in Washago, Ontario, he becomes entangled in a mystery dating back to World War II. Are the papers connected to an escape of Nazi prisoners-of-war from a nearby camp in 1943? With help from his friend, Amanda, and some colourful local characters, Angus draws on his considerable resourcefulness and intellect to unearth answers to questions that have remained buried for generations. However, the deeper Angus digs, the closer he may come to destroying a precious family relationship. The Secret of the Old Swing Bridge is a novel for young readers and adults alike. The story is set at a railway junction featured in three of Ian Wilson's steam railway books. 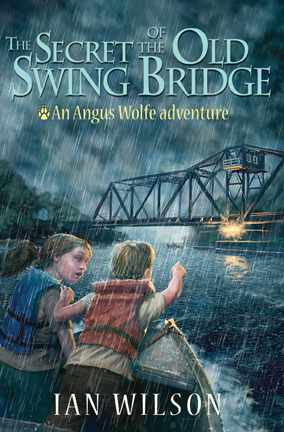 The Secret of the Old Swing Bridge is the first in a series of classic mystery-adventure stories featuring Angus Wolfe and Amanda Webb. Overseas readers please email us for a shipping quote.